Its Keren here for the Faber-Castell Design Memory Craft blog featuring a set of ATC’s using the new Paper Flowers kit, the Texture Luxe™ Copper paste and a few of the new Mixed Media Stencils from the 102 set. You can watch the step by step video below to see how I created these ATC’s. Hi Everyone its Keren here with three ATC's designed for the Farber-Castell Design Memory Craft® blog. I've Mixed & Matched Gelatos® and other Farber-Castell Design Memory Craft products to create texture and colour on the background. 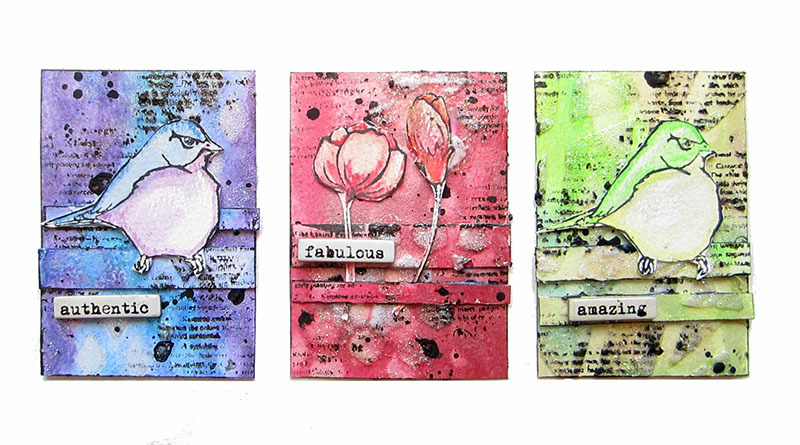 I also have a step by step video tutorial on how I created these ATC's. Hello Everyone! It's Limor Webber here today! We’re hopping with May Arts this week! We’re so excited to be partnering again with them and crafting with their fabulous ribbons. Are you ready for an inspiration filled week with giveaways? Here’s how you can enter: Stop by our blog and the May Arts blog each day this week and leave a comment. Two winners will win $50 of product from us, and 3 spools of ribbons from May Arts. I wanted to show you a super quick tutorial on a different way you can use your ribbons. Join me in 3 super quick steps to create this background. Take your favorite Gelatos® and apply them on to the ribbon as shown. With a paint brush, water and your finger go ahead and start blending those colors together. You'll start to see how easy those creamy and silky colors just mix and blend. The last step to my background was adding a little bit of the white Gelatos® to tone down the brightness and allow all three colors to blend perfectly. Here is an example of how easy it is to complete this card in seconds using any stencil and an inspirational sticker or phrase! Hi everyone! Christine here. Today's project was inspired by my three-year-old nephew. We'll be opening gifts together on Christmas morning and I want him to be able to find his own gift under the Christmas tree, despite not being able to read quite yet. Like you, I have a number of gifts to tag and wanted something personal, but simple. And I wanted to use supplies I already had. Voila, Christmas Photo Tags were born! ATC's 1 drawing, three ways! Hey there Rita Barakat here! Today I am sharing some ATC's I have been working on! So I had this idea - 1 drawing three ways. I thought what if I drew one girl and traced her two more times - could I make three totally different ATC's? Of course the answer is YES! First step, trace on each ATC. ( I am just drawing on tracing paper so all of the details don't necessarily transfer but that's OK. With the basics in time to place, it's time to make adjustments- different hair,lips, eyes... Time for color! This time I grabbed my Art GRIP® Aquarelles. Spread the color with a wet paint brush. Hair color is so fun!!! Gold Gelatos®Colors for the background! A black PITT® Artist Pen for details and there you have it! 1 drawing, 3 ways! Rita Barakat Mixed Media Artist, Illustrator and Designer & Educator. From wall murals to itty bitty minis you can find her work in various hospitals, corporations, family homes, manufacture websites and magazines. She designs for the Faber-Castell Design Memory Craft® team, DCWV The Crafters Workshop and freelances for a variety of manufacturers. Making multicolor watercolor backgrounds with Gelatos ! Hello!everyone .It's Yuko here again! I went to watch a poppy with my family the other day. A poppy is one of my favorite flowers. 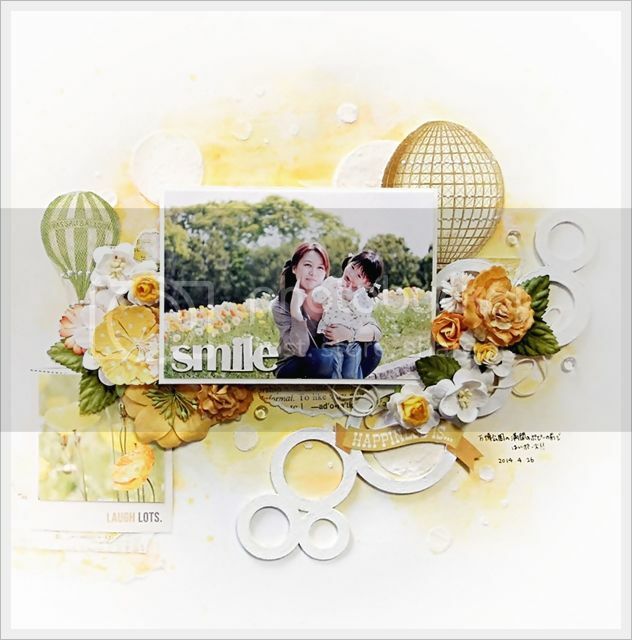 I was made this layout from the favorite photograph taken with the daughter. It was created using the gelatos mainly background. I used Gesso, also Whipped Sparkle. 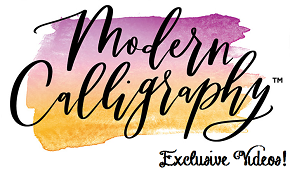 Hello Blogosphere! It's Tiffany here with another Video Tutorial for you! 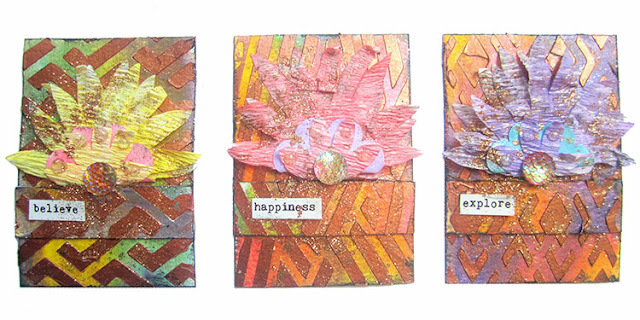 This time, I'll be showing you my personal spin on these cool Artist Trading Blocks! I consider these three primary colors to be an artist's building blocks. It's our introduction into color theory! It where all color stems from. So, I'll be using some of your favorite Faber-Castell® Design Memory Craft® products to jazz up these Sizzix Artist Trading Blocks! I hope you enjoyed today's tutorial.